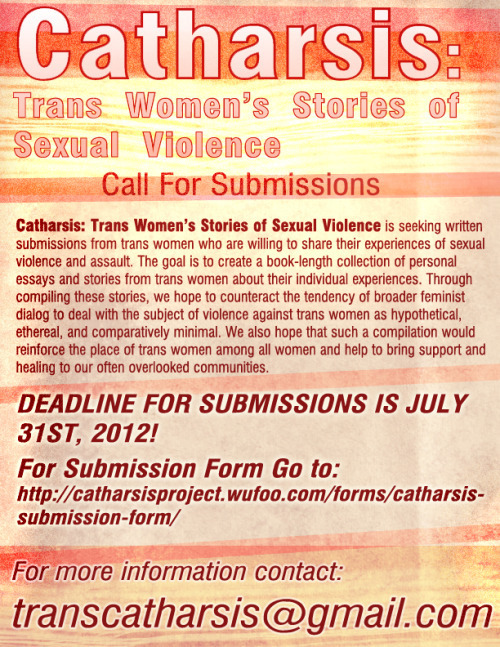 Catharsis: Trans Women’s Stories of Sexual Violence is seeking written submissions from trans women who are willing to share their experiences of sexual violence and assault. The goal is to create a book-length collection of personal essays and stories from trans women about their individual experiences. Through compiling these stories, we hope to counteract the tendency of broader feminist dialog to deal with the subject of violence against trans women as hypothetical, ethereal, and comparatively minimal. We also hope that such a compilation would reinforce the place of trans women among all women and help to bring support and healing to our often overlooked communities. DEADLINE FOR SUBMISSIONS IS JULY 31ST, 2012! This entry was posted in community and tagged call for submissions, sexual violence. Bookmark the permalink.